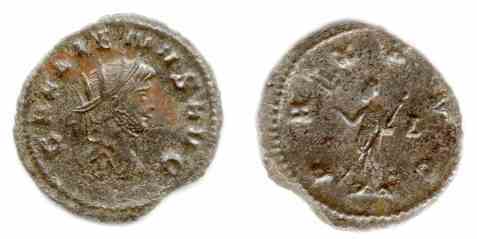 Bronze antoninianus, 23mm, 3.8gm, issued AD 262. Rome mint. Obv: GALLIENVS AVG, Radiate bust right. Rev: PAX AVG, Pax with branch and sceptre, in field right A or delta. References: RIC 742, RSC 739. Little wear but not well produced as is typical for this period.